One of my Mullet Socks is finished. When I mentioned the socks to a couple of friends, they thought that there might be some kind of long stands on the back. Actually, I wasn't thinking of copying the Mullet haircut exactly. Instead, I was thinking of the theory behind it. The definition of a mullet hairdo is: "business in the front, party in the back." So, these socks are meant to be business/party socks. However, if you lift the pant leg and kick off your shoe, it's now time to Party!! For some reason, the green looks a little muddy in the photo, but it isn't. It a nice, clear dark green, as in the photo, below. For these socks I used all of the colors in Cabin Cove's Moose Toes sock kit. 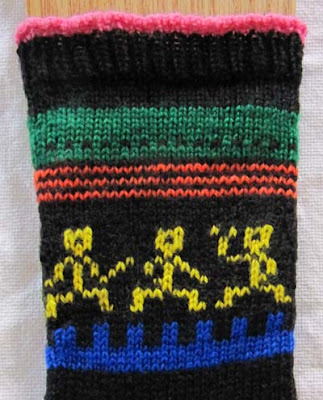 I found a knitting graph of African dancers that I liked in "1000 Great Knitting Motifs" (page 240). I like this book very much - lots of inspirations. I had to change the graph slightly to make it fit onto the sock. Other than knowing that I wanted to use this graph, I had no plan at all. I was winging it all the way through, although I did make good notes so that I can make the second sock match the first one - IF I want them to match. Maybe party socks should be different from each other. I'll decide later. 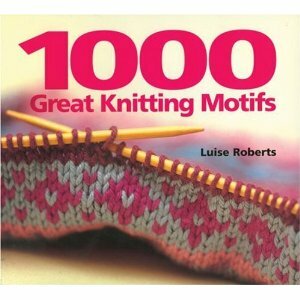 once I start knitting. I started with casting on 120 stitches and immediately knit 2 together around to make a small ruffle. After that, I just changed colors when it felt right. The sock is my basic generic one. 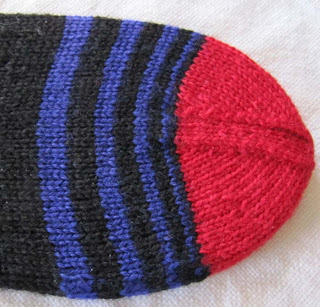 After using all but two of the colors, and while still working on the leg, I switched and knit only in black until I was almost to the toe. 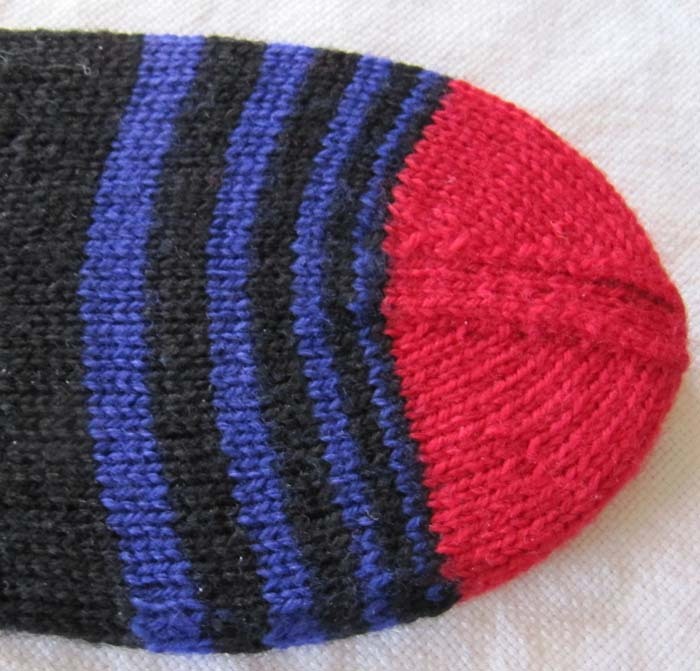 Then, I returned to the colors, using the remaining two: purple to finish the foot in decreasingly narrowing stripes, then red for the toe. 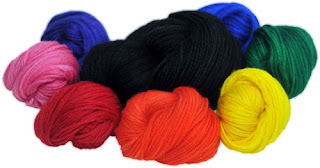 The yarn is a little thinner than other sock yarn and the black is very, very dark, which means the stitches are almost indistinguishable. I like that about this yarn as it give a very smooth look to the sock. 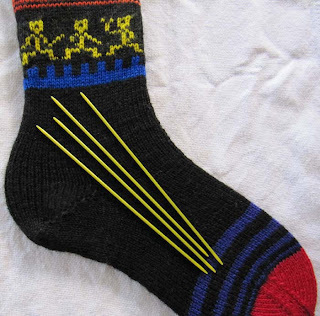 I found that the best way to knit was with my yellow, pointy plastic double-pointed needles. It made it much easier on my eyes as I could spot a split or dropped stitch immediately - the right tools for the job. This was such a fun project. I'm now going back to my Opal socks to finish up that pair and then I'll return to the second Mullet sock. No "second sock syndrome" for me! One more thing, there is a brand new group, started yesterday, on Ravelry, "Friends of Cabin Cove". Join us, won't you? Love the sock! 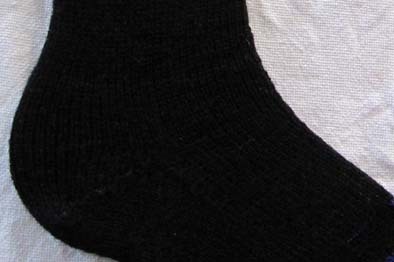 What a great idea to have a fun sock on the cuff and top of the leg and plain where it shows in public. Those are looking nothing short of fantastic! 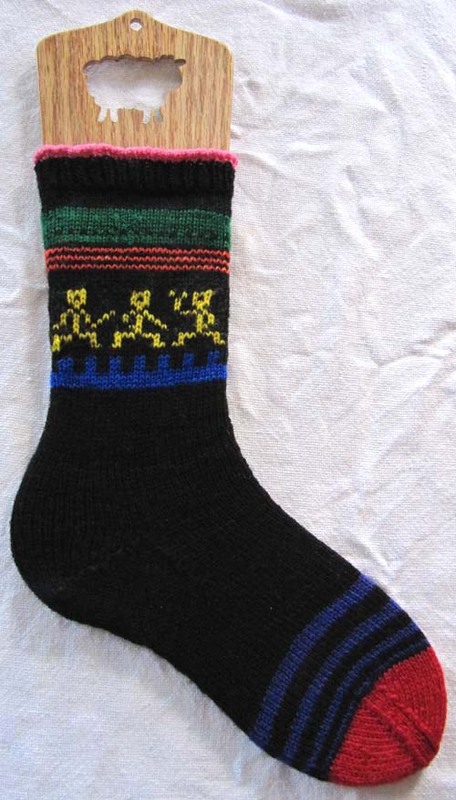 The African dancers really tie in the meaning of Mullet socks and party. No Lyin', I'm Knittin' a Lion!